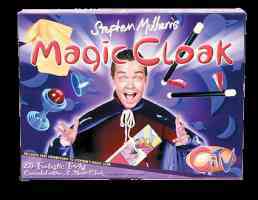 Paul Daniel is too creepy to still be plying his magic trade to the young (thankfully) and CITV's Stephen Mulhern has taken his mantle and continues to amuse and delight children in the same way Daniels did over 20 years ago. In an age where magic is starting to become popular again (Harry Potter and The Lord of the Rings mania are sweeping the nation at the moment) you'd be wise to snap this up before the Christian fundamentalists cry for public burnings for anyone involved in witchcraft. Upstarts magic set allows the little magician in the family to look and feel the part thanks to the inclusion of a magician's cloak and wand. Admittedly none of the tricks here are completely original and have been available in magic sets sponsored by David Nixon, Paul Daniels or whoever was the popular magician of the time, but Upstarts' kit revitalises an almost dead art. This will definitely keep the little magician in the family entertained for some time to come.